By Tommy Robbins. This is LOAD FILE, where we open our eyes to the world around us and dive right in. This week, Tommy assesses the debut title for the Nintendo Switch, ‘The Legend of Zelda: Breath of the Wild’, also available for the Wii U. The Legend of Zelda is a series that’s always had a certain air about it, a mystique that for some has made it difficult to penetrate. For others, that aura has long supplied the fuel required to defend even its worst installations. The Legend of Zelda: Breath of the Wild is Nintendo’s newest take on a series that’s been consistently producing entries for longer than many of us have graced this planet. And it’s one that makes many, many attempts to diverge from the trappings that have previously defined the franchise, intelligently categorizing what is imperative and what is simply old-hat. 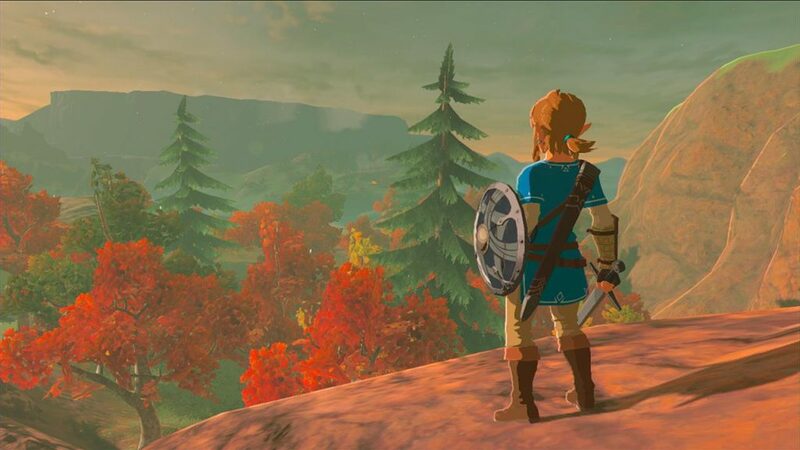 As someone who has spent their entire life standing just outside of Zelda fandom, never quite understanding the series or what made it great (though constantly trying), I consider the changes found here a necessary step towards making the first truly great Zelda game that anyone can enjoy. Let’s review The Legend of Zelda: The Breath of the Wild. 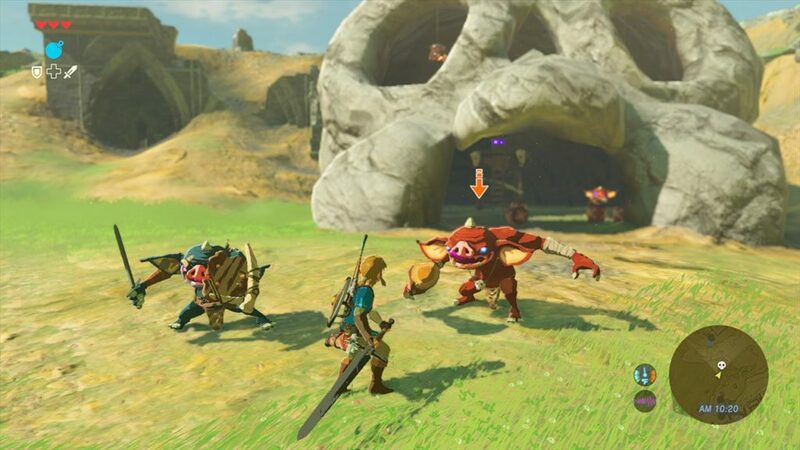 It should come as no surprise that Breath of the Wild is a typical hero’s journey: Link must save Princess Zelda and the land of Hyrule from the clutches of the imposing Calamity Ganon. It’s hardly an unfamiliar set-up and yet somehow the story, which has a darkness to it that I’ve never felt in previous installments, manages to bring some heft to the proceedings. It’s refreshing. From the Shrine of Resurrection our stalwart hero awakes to find that all his memories have faded. Through this story contrivance comes a more nuanced way for the game to deliver the heavier pieces of its story. Wait, a Zelda game that’s not bursting with predictable narrative exposition? That’s right: in Link’s possession are photographs of far-off landmarks, there to represent the blank spaces in Link’s memory, and finding these locations fills in those blanks and furthers the story. What’s contained within those memories will vary. Whether it’s a moment shared with Zelda or an instance of foreboding realization, these moments all paint a picture of the world as it was one hundred years ago, as an impending confrontation with Ganon loomed and Hyrule struggled in preparation for battle. 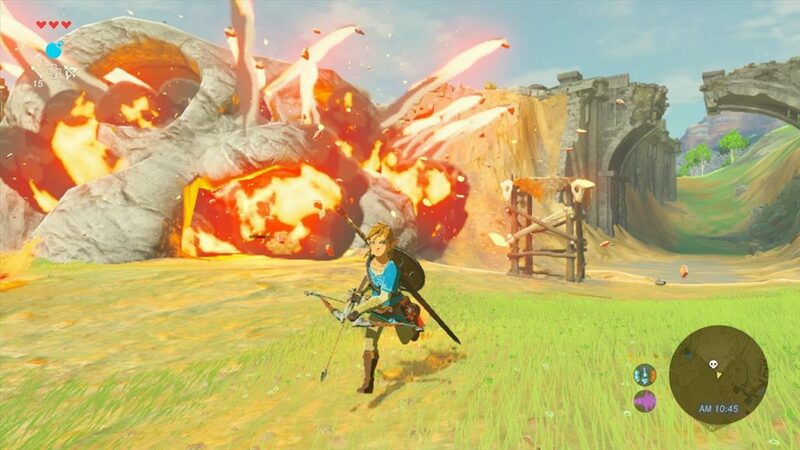 What’s utterly brilliant is that, while these memories serve as the game’s backdrop, Breath of the Wild allows you to decide which memories are most vital to your experience. The more Link remembers and the more the world opens up, the more you’re faced with a question: do I want to go down this particular road? The freedom in The Legend of Zelda: Breath of the Wild hearkens back to what made the original games so great. 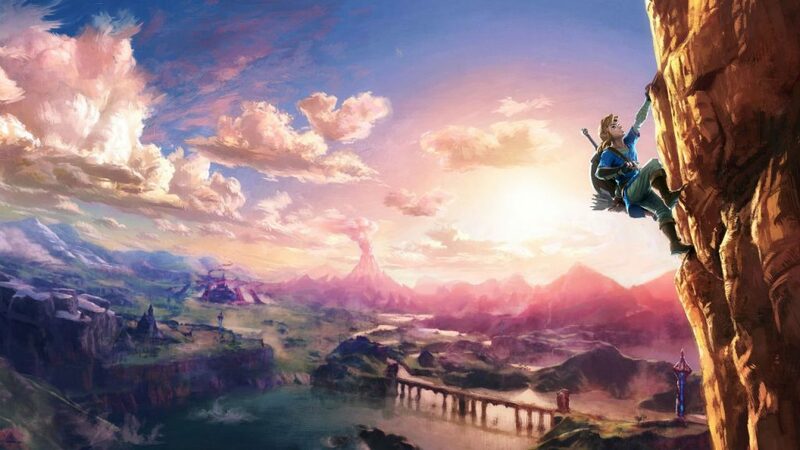 Though things happen very differently in Breath of the Wild, the game manages to capture that sense of exploration and enables each player to experience a story completely independent from everyone else. Simply put: no two players will have the same adventure. Following Link’s descent from the opening area plateau, he will find himself equipped with quite an arsenal: bombs, time manipulation (for immobilizing objects), magnetization (allowing for large metal items to be picked up and slung around at will), and a freezing touch (that allows Link to summon ice pillars from any source of water). All of these abilities can be used at anytime, anywhere. There’s even nuance to be found in this facet of this game. For instance, bombs sport spherical and cubed versions designed to maximize the player’s intent. Want that bomb to roll down the hill? Nintendo’s got you. It’s easy to assume that limitations will come with this wealth of abilities. Let’s talk for a moment about emergent systems in Breath of the Wild. While the obvious uses of certain abilities will come frequently, every once in awhile a solution occurs in which the player might find themselves asking Could I just… certainly that won’t work… and it almost certainly will. In every moment, whether it you’re encountering the puzzles of a shrine or just manipulating the environment, Breath of the Wild is a yes-man. If you can cobble together some assortment of abilities to accomplish a goal, the game will usually meet you in the middle. Need to climb that cliff side to get to a vantage point? Spawn a bomb and use magnesis to stack a metal crate on it, climb on board, and blast yourself into the heavens. (A far more satisfying means of travel.) This is a game that rewards creativity. The Legend of Zelda: Breath of the Wild does so many things that it feels like there’s no amount of words that can properly encompass all that it gets right. Everyone will find their own bread and butter here — whether it be dynamic storytelling or complete narrative absence, objective-based gameplay or dizzying open-world freedom, finding the intended solution or creating your own — Breath of the Wild caters to all. In a moment shortly after I dove into Breath of the Wild, I wanted to talk to someone about my findings thus far. Calling upon a Zelda-fan-friend, I found myself frantically trying to explain all of the incredible moments I had already witnessed. As I described the utter freedom to explore and form your own style, to make each choice and to play at the pace that suits you, he said, “That’s what I loved about the originals.” And it clicked. By changing so much of the formula to fit its open-world game design, Nintendo found what made the original Zelda titles so strong. It’s a return to form without holding onto those characteristics that felt dated — doing away with weighty narrative and hours of hand-holding tutorial in exchange for the ability to simply embark on your own adventure with complete freedom. And it’s that freedom to explore that creates a sense of wonder around every corner. Directed by Hidemaro Fujibayashi, Daiki Iwamoto, and Takuhiro Dohta. Composed by Manaka Kataoka, and Yasuaki Iwata. Platform(s): Nintendo Switch, Wii U.